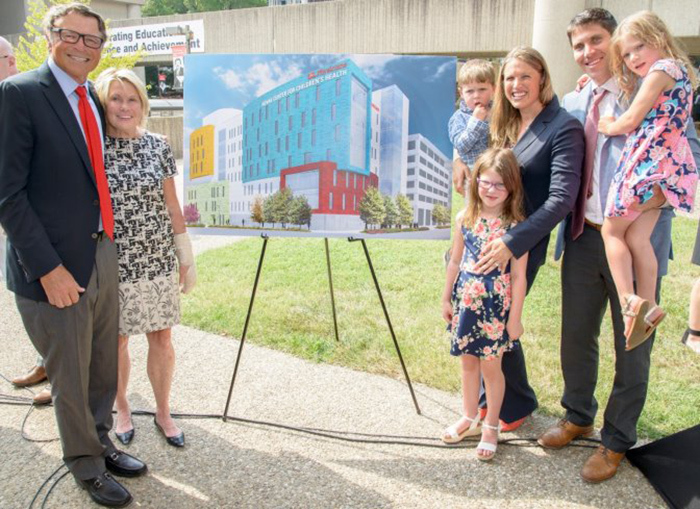 David and Wendy Novak, left, and their family stand with the architect’s rendering of the new Novak Center for Children’s Health in July 2017. LOUISVILLE, Ky. (May 31, 2018) — A new era in medical care for children will begin this June when the Novak Center for Children’s Health at the University of Louisville opens to patients and their families. A preview of the new 176,000-s.f. facility was held May 31 for supporters and friends of the university, including the building’s namesakes, David and Wendy Novak, their family and their foundation, the Lift-A-Life Foundation. The retired CEO of Louisville-based Yum! Brands, David Novak headed the lineup of dignitaries launching the building’s debut, including University of Louisville Board of Trustees Chair David Grissom, UofL President Neeli Bendapudi, Ph.D., and UofL Executive Vice President for Health Affairs Gregory Postel, M.D. Honored among the group were the Novaks’ daughter, Ashley Novak Butler, for her leadership with the project along with others who played a role: Tony and Lisa Christensen, the WHAS Crusade for Children, Bruce Henderson and Henderson Services, Lynnie Meyer and Emmett Ramser of Norton Healthcare, and the former vice president of advancement at UofL and current Kosair Charities President Keith Inman. David Novak lauded the facility for creating the environment where a new paradigm of health care for children will be fostered. The Novak Center will house all general, specialty and subspecialty pediatrics services in a single eight-story building, meaning patients and their families will be able to have all their needs handled in one convenient location. An anticipated 135,000 patient visits will occur annually in the new center – now one of the largest and most technically advanced pediatric outpatient centers in the United States. Designed in kid-friendly colors, the facility features several public areas with soft seating and interactive screens to entertain children while they wait to see providers. But the waiting shouldn’t be long, say UofL Department of Pediatrics providers: The latest in technological advances, the Real Time Locator System, will help move patients and providers to their appointments without lengthy wait times. Also included in the facility will be the Wendy Novak Diabetes Center, created in 2015 with support from the Novaks and currently housed in the Children’s Hospital Foundation Building. The Wendy Novak Diabetes Center provides comprehensive diabetes care as well as access to clinical research trials that sometimes are patients’ only chance at diseases management and survival. The Novak Center for Children’s Health will be staffed by faculty physicians practicing with UofL Physicians and will open for patient appointments in June. To learn more about the scope of pediatric health care at UofL, visit www.UofLPhysicians.org. The Novak Center for Children’s Health is located at 411 E. Chestnut St. Budget to construct the new facility was $79 million. Messer was construction manager for the project.